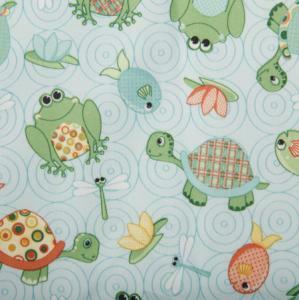 A Polyurethane Laminated PUL that is the perfect choice of fabric for diaper-making moms and all those choosing to make adorable, unique diaper covers and accessories. Tested and proven to be safe for baby. 100% Polyester fabric backed, 100% polyurethane coating fabric is durable, waterproof, breathable, machine washable and machine dryable, will not separate and has a nice soft hand. Limit bleach to occasional use to avoid fading or breakdown. 64" wide, 8 yard bolt.